Adams Golf has been creating golf clubs with hybrid technology for more the last 25 years. The company’s Speedline drivers introduced fans to a new aerodynamic shape that significantly improved performance and reduced drag. The driver that was awarded the “Golf Digest Hot List Golf Medal” three years ago has now released an improved version of its award-winning design. The Adams Golf Speedline F11 Driver has an improved aerodynamic design with even greater forgiveness. Even the look of the driver’s clubhead shows its aerodynamic design. Engineers have refined and shaped the clubhead to allow golfers to get a faster swing and further distance. 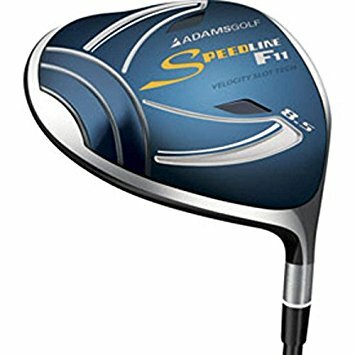 In addition, the Adams Golf Speedline F11 Driver is made with the company’s patented Velocity Slot Technology, or VST. Visible to the naked eye, VST is integrated into the crown and sole. With VST, the clubhead keeps the airflow attached during the swing, which further reduces drag. VST has been shown to reduce drag by 35 percent. Together, aerodynamic design and VST create a large footprint driver that is quick, easy-to-hit and forgiving. Standard features include a range of lofts and a large, 460cc head. The club excels at compensating for top and bottom mis-hits. Player reviews have been more positive: Amazon’s rating is 5 stars, and Adams fans, while somewhat biased, have rated it 4.9 stars. This Adams Driver is an all-around driver that performs well in many areas and has been used by all levels of players.